, surnamed the Great, was born of a patrician family, equally conspicuous for its virtue and nobility at Rome, where his father Gordian was a senator, and extremely rich; and, marrying a lady of distinction, called Sylvia, had by her this son, about the year 544. From his earliest years he discovered genius and judgment; and, applying himself particularly to the apophthegms of th | ancients, he fixed every thing worth notice in his memory, where it was faithfully preserved as in a store-house; he also improved himself by the conversation of old men, in which he took great delight. By these methods he made a great progress in the sciences, and there was not a man. in Rome, who surpassed him in grammar, logic, and rhetoric; nor can it be doubted but he had early instructions in the civil law, in which his letters prove him to have been well versed: he was nevertheless entirely ignorant of the Greek language. 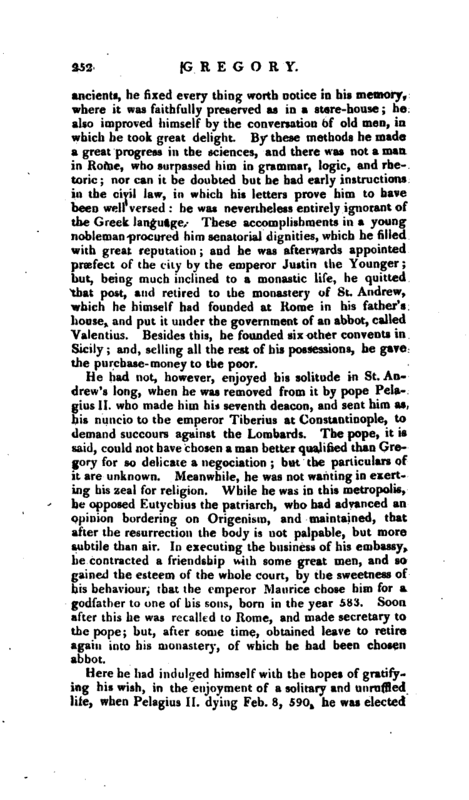 These accomplishments in a young nobleman procured him senatorial dignities, which he filled with great reputation and he was afterwards appointed praefect of the city by the emperor Justin the Younger but, being much inclined to a monastic life, he quitted that post, and retired to the monastery of St. Andrew, which he himself had founded at Rome in his father’s house, and put it under the government of an abbot, called Valentius. Besides this, he founded six other convents in Sicily; and, selling all the rest of his possessions, he gave the purchase-money to the poor. He had not, however, enjoyed his solitude in St. Andrew’s long, when he was removed from it by pope Pelagius II. who made him his seventh deacon, and sent him as his nuncio to the emperor Tiberius at Constantinople, to demand succours against the Lombards. The pope, it is said, could not have chosen a man better qualified than Gregory for so delicate a negociation; but the particulars of it are unknown. Meanwhile, he was not wanting in exerting his zeal for religion. While he was in this metropolis, he opposed Eutychius the patriarch, who had advanced an opinion bordering on Origenism, and maintained, that after the resurrection the body is not palpable, but more subtile than air. In executing the business of his embassy, he contracted a friendship with some great men, and so gained the esteem of the whole court, by the sweetness of his behaviour, that the emperor Maurice chose him for a godfather to one of his sons, born in the year 583. Soon after this he was recalled to Rome, and made secretary to the pope; but, after some time, obtained leave to retire again into his monastery, of which he had been chosen abbot. Here he had indulged himself with the hopes of gratifymg his wish, in the enjoyment of a solitary and unruffled lite, when Pelagius II. dying Feb. 8, 590, he was elected | pope by the clergy, the senate, and the people of Rome; to whom he had become dear by his charity to the poor, whom the overflowing of the Tiber, and a violent plague, had left perishing with hunger. 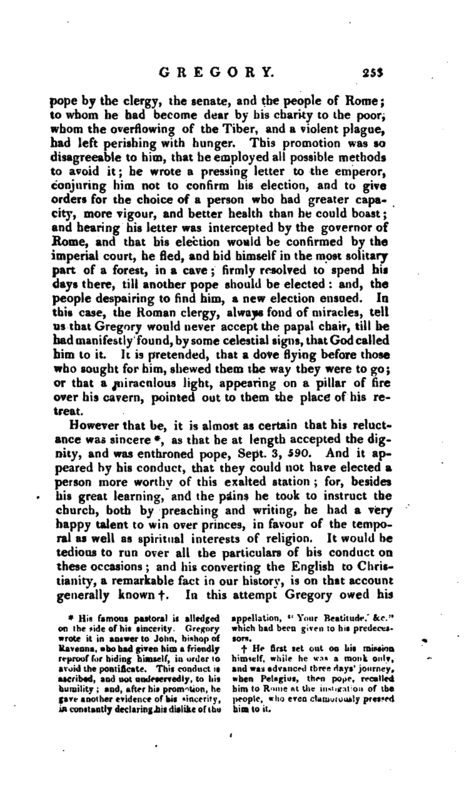 This promotion was so disagreeable to him, that he employed all possible methods to avoid it; he wrote a pressing letter to the emperor, conjuring him not to confirm his election, and to give orders for the choice of a person who had greater capacity, more vigour, and better health than he could boast; and hearing his letter was intercepted by the governor of Rome, and that his election would be confirmed by the imperial court, he fled, and hid himself in the most solitary part of a forest, in a cave firmly resolved to spend his days there, till another pope should be elected and, the people despairing to find him, a new election ensued. In this case, the Roman clergy, always fond of miracles, tell us that Gregory would never accept the papal chair, till he had manifestly found, by some celestial signs, that God called him to it. It is pretended, that a dove flying before those who sought for him, shewed them the way they were to go; or that a miraculous light, appearing on a pillar of fire over his cavern, pointed out to them the place of his reeat. His famous pastoral is alledged on the side of his sincerity. Gregory wrote it in answer to John, bishop of Ravenna, who had given him a friendly reproof for hiding himself, in order to avoid the pontificate. This conduct is ascribed, and not undeservedly, to his humility and, after his promotion, he gave another evidence of his sincerity, in constantly declaring his dislike of the appellation, “Your Beatitude, &c.” which had been given to his predecessors. He first set out on his mission himself, while he was a monk only, and was advanced three days’ journey, when Pelagius, then pope, recalled him to Rome at the instigation of the people, who even clamorously pressed him to it. In this attempt Gregory owed his | success to the assistance of queen Ethelburga, who not only prompted the king Ethelbert her consort, to treat the pope’s missionaries kindly, but also to become himself a convert. The new pope, according to custom, held a synod at Rome the same year, 591; whence he sent letters to the four patriarchs of the East, with a confession of his faith, declaring his reverence to the four general councils, and the fifth too, as well as the four gospels. In this modesty he was not followed by his successors; and he even exceeded some of his predecessors in that and other virtues, which for many ages past have not approached the chair of St. Peter. As he had governed his monastery with a severity unparalleled in those times; so now he was particularly careful to regulate his house and person according to St. Paul’s directions to Timothy. Even in performing divine worship, he used ornaments of but a moderate price, and his common garments were still more simple. Nothing was more decent than the furniture of his house, and he retained none but clerks and religious in his service. By this means his palace became a kind of monastery, in which there were no useless people; every thing in his house had the appearance of an angelic life, and his charity surpassed all description. He employed the revenues of the church entirely for the relief of the poor; he was a constant and indefatigable preacher, and devoted all his talents for the instruction of his flock. 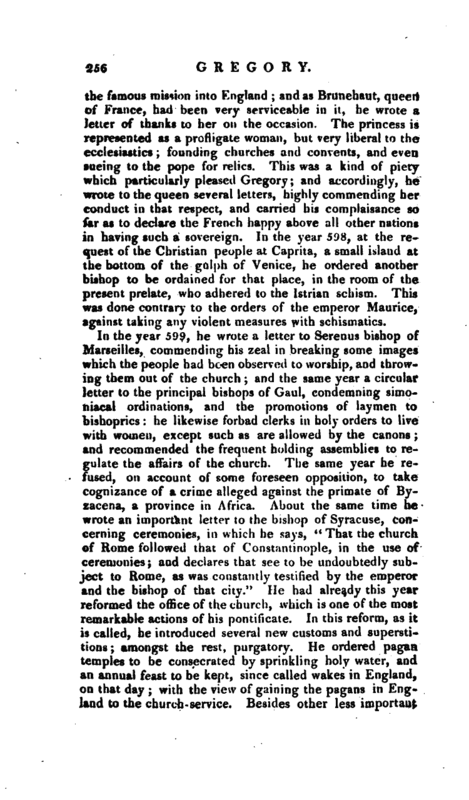 In the mean time, he extended his care to the other churches under his pontifical jurisdiction, and especially those of Sicily, for whom he had a particular respect; he put an end to the schism in the church of Iberia the same year: this was effected by the gentle methods of persuasion, to which, however, he had not recourse till after he had been hindered from using violence. Upon this account he is censured as an intolerant; and it is certain his maxims on that head were a little inconsistent. He did not, for instance, approve of forcing the Jews to receive baptism, and yet he approved of compelling heretics to return to the church. In some of his letters too he exclaims against violence in the method of making converts, yet at the same time was for laying heavier taxes on such as would not be converted by persuasive means; and in the year 593, he sent a nuncio to Constantinople, and wrote a letter the same year to the emperor Maurice, | declaring his humility and submission to that sovereign; he also shewed the same respect to the kings of Italy, though they were heretics. The same year he composed his “Dialogues,‘’ a work filled with fabulous miracles and incredible stories; the style is also, low, and the narration coarse yet they were received with astonishing applause and Theodilinda, queen of the Lombards, having converted her husband to the catholic faith, the pope rejoiced at it, and sent his” Dialogues," composed the following year, to that princess. 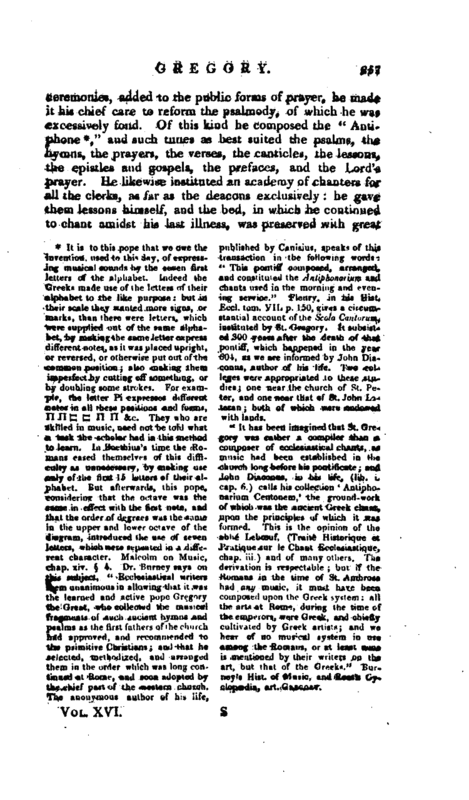 She is thought to have made use of his book at this time for the conversion of that people, who were easily influenced by such compositions, for the same reason pope Zachary, about 150 years after, translated it into Greek for the use of those people, who were so delighted with it, that they gave St. Gregory the surname of Dialogist. Still these dialogues being the composition of Gregory is a point now thought very doubtful. In the year 594, he excommunicated and suspended the bishop of Salona, the metropolis of Dalmatia, who, however, paid no regard to the exercise of his power in these censures. The same year he laboured to convert the infidels in Sardinia by gentle methods/ according to his system: which was, to punish heretics, especially at their first rise, as rebels and traitors, but to compel infidels only indirectly; that is, treating the obstinate with some rigour, and persuading them as much by promises, threats, and gentle severities, as by argument and reason. This was the distinction he made in treating with the Manichees and pagans. In the year 595, he refused to send the empress Constantia any relics of St. Paul, which she had requested, desiring to look at the body of that apostle. On this occasion he relates several miraculous punishments for such a rash attempt, all as simply devised as those in his< Dialogues." 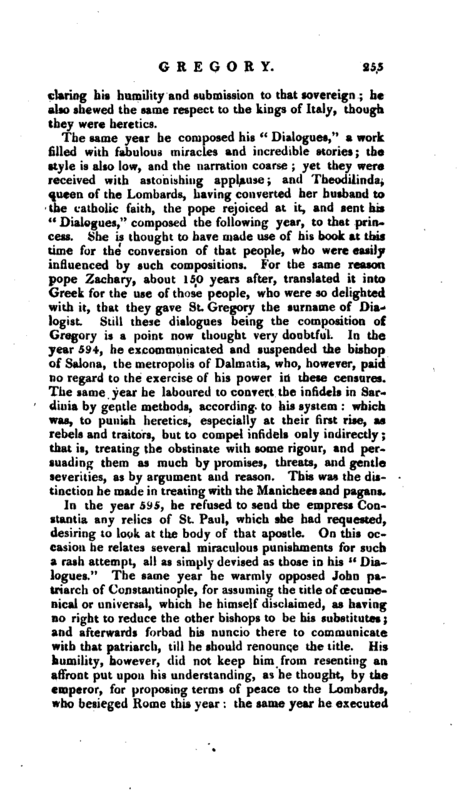 The same year he warmly opposed John patriarch of Constantinople, for assuming the title of oecumenical or universal, which he himself disclaimed, as having Do right to reduce the other bishops to be his substitutes; and afterwards forbad his nuncio there to communicate with that patriarch, till he should renounce the title. His humility, however, did not keep him from resenting an affront put upon his understanding, as he thought, by the emperor, for proposing terms of peace to the Lombards, who besieged Rome this year: the same year he executed | the famous mission into England; and as Brunehaut, queen of France, had been very serviceable in it, he wrote a letter of thanks to her on the occasion. The princess is represented as a profligate woman, but very liberal to the ecclesiastics; founding churches and convents, and even sueing t9 the pope for relics. This was a kind of piety which particularly pleased Gregory; and accordingly, he wrote to the queen several letters, highly commending her conduct in that respect, and carried his complaisance so far as to declare the French happy above all other nations in having such a sovereign. In the year 598, at the request of the Christian people at Caprita, a small island at the bottom of the gulph of Venice, he ordered another bishop to be ordained for that place, in the room of the present prelate, who adhered to the Istrian schism. This was done contrary to the orders of the emperor Maurice, against taking any violent measures with schismatics. It is to this pope that we owe the invention, used to this day, of expressing musical sounds by the seven first letters of the alphabet. Indeed the Greeks made use of the letters of their alphabet to the like purpse but in their scale they wanted more signs, or marks, than there were letters, which were supplied out of the same alphabet, by making the same letter express different notes, as it was placed upright, or reversed, or otherwise put out of the common position; also making them imperfect by cutting off something, or by doubling some strokes. For example, the letter Pi expresses different notes in all these positions and forms, ft n C C It Ft &c. They who are skilled in music, need not be told what a task the scholar had in this method to learn. In Uoethius’s time the Roaiians eased themselves of this difficulty as unnecessary, by making use nly of the first 15 letters of their alphabet. But afterwards, this pope, considering that the octave was the same in effect with the first note, and that the order of degrees was the same in the upper and lower octave of the diagram, Introduced the use of seven letters, which were repeated in a different character. Malcolm on Music, chap. xiy. 4. 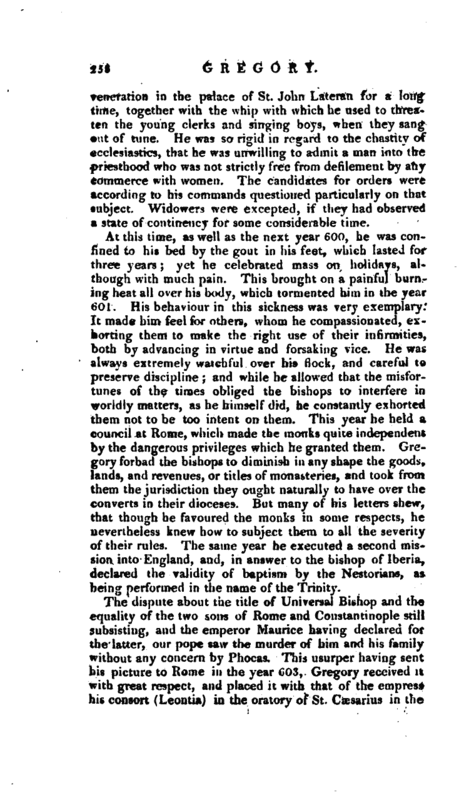 Dr. Burney says on this subject, “Ecclesiastical writers seem unanimous in allowing that it was the learned and active pope Gregory the Great, who collected the musical fragments of such aacient hymns and psalms as the first fathers of the church had approved, aud recommended to th primitive Christians; and that he selected, methodized, and Hrnmged them in the order which was long continued at Rome, and sooa adopted by the chief part of the western church. The anonymous author of his life, published by Canisius, speaks of this transaction in the following words ”Thi* pontiff composed, arranged, and constituted the Antiphonailum and chants used in the morning atid evening service.“Flenry, in his Hist. Ecol. torn. VII. p. 150, gir<-s a dicumstantial account of the Scola Cantorum t instituted by St. Gregory. 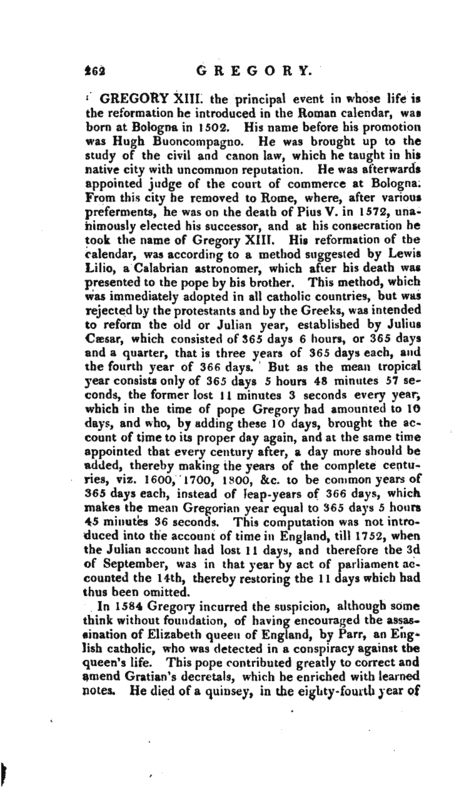 It subsisted 300 years after the death of that pontiff, which happened in the year 604, as we are informed by John Diaconus, author of his life* Two colleges were appropriated to these studies; one near the church of St. Peter, and one near that of St. John Lateran; both of which were endowed with lands. 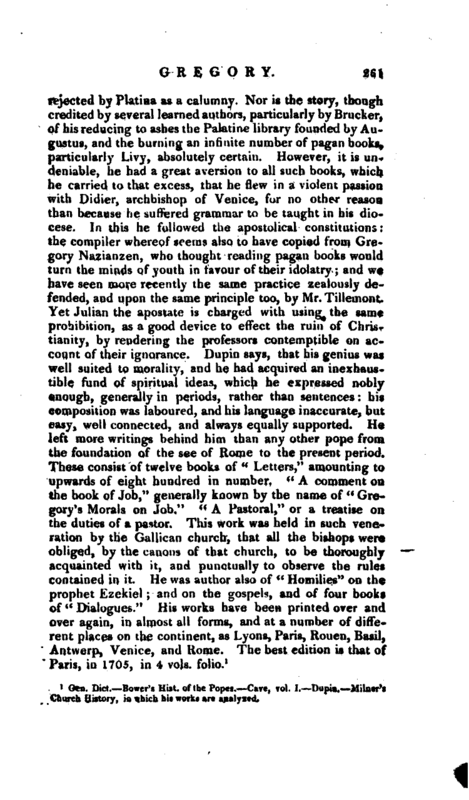 ”It has been imagined that St. Gre* gory was rather a compiler than a composer of ecclesiastical chants, as mu-uc had been established in the church long before his pontificate; and John Diaconus, in his life, (lib. i. cap. 6.) calls his collection ‘ Antiphonarium Centonem,’ the ground-work of which was the ancient Creek chaut, upon the principles of which it was formed. This is the opinion of the alh Lebceuf, (Traits Historinue oc Pratique sur le Chant Eccioaiastique, chap, iii.) and of many others. The derivation is respectable; but if the Romans in the time of St. Ai; had any music, it must have been composed upon the Greek system: all the arts at Rome, during the time of the emperors, were Greek, and chit-fly cultivated by Greek artists; and we hear of no musical system in use among the Romans, or at least none is mentioned by their writers ou the art, but that of the Greeks." Burney’s Hist, of Music, and Rees’s Cyclopwdia, art. Greory. | Generation in the palace of St. John Lateran for a long time, together with the whip with which he used to threaten the young clerks and singing hoys, when they sang out of tune. He was so rigid in regard to the chastity of ecclesiastics, that he was unwilling to admit a man into the priesthood who was not strictly free from defilement by any commerce with women. The candidates for orders were according to his commands questioned particularly on that subject. Widowers were excepted, if they had observed a state of continency for some considerable tiifie. At this time, as well as the next, year 600, he was confined to his bed by the gout in his feet, which lasted for three years; yet he celebrated mass on holidays, although with much pain. This brought on a painful burning heat all over his body, which tormented him in the year 601. His behaviour in this sickness was very exemplary. It made him feel for others, whom he compassionated, exhorting them to make the right use of their infirmities, both by advancing in virtue and forsaking vice. He was always extremely watchful over his flock, and careful to preserve discipline; and while he allowed that the misfortunes of the times obliged the bishops to interfere in worldly matters, as he himself did, he constantly exhorted them not to be too intent on them. This year he held a council at Rome, which made the monks quite independent by the dangerous privileges which he granted them. Gregory forbad the bishops to diminish in any shape the goods, lands, and revenues, or titles of monasteries, and took from them the jurisdiction they ought naturally to have over the converts in their dioceses. But many of his letters shew, that though he favoured the monks in some respects, he nevertheless knew how to subject them to all the severity of their rules. The same year he executed a second mission into England, and, in answer to the bishop of Iberia, declared the validity of baptism by the Nestorians, as being performed in the name of the Trinity. 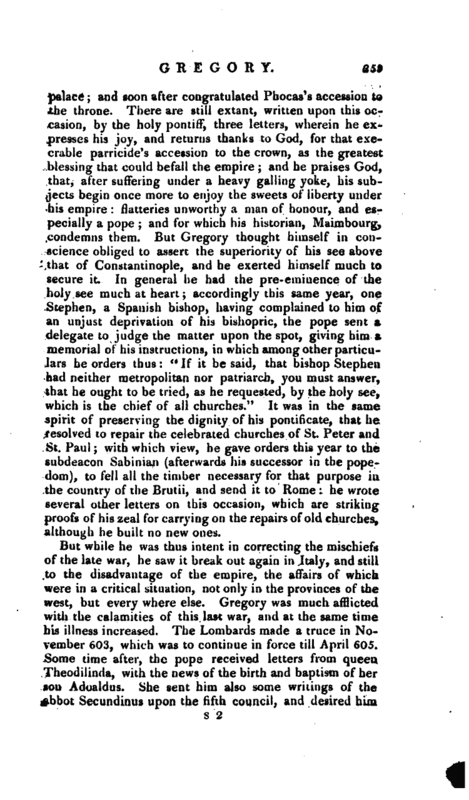 The dispute about the title of Universal Bishop and the equality of the two sons of Rome and Constantinople still subsisting, and the emperor Maurice having declared for the latter, our pope saw the murder of him and his family without any concern by Phocas. This usurper having sent his picture to Rome in the year C03, Gregory received it with great respect, and placed it with that of the empress his consort (Leontia) in the oratory of St. Csesarius in the | palace; and soon after congratulated Phocas’s accession to the throne. There are still extant, written upon this occasion, by the holy pontiff, three letters^ wherein he expresses his joy, and returns thanks to Godj for that execrable parricide’s accession to the crown, as the greatest blessing that could befall the empire; and he praises God, that, after suffering under a heavy galling yoke, his subjects begin once more to enjoy the sweets of liberty under his empire flatteries unworthy a man of honour, and especially a pope and for which his historian, Maimbourg, condemns them. But Gregory thought himself in conscience obliged to assert the superiority of his see above that of Constantinople, and he exerted himself much to secure it. 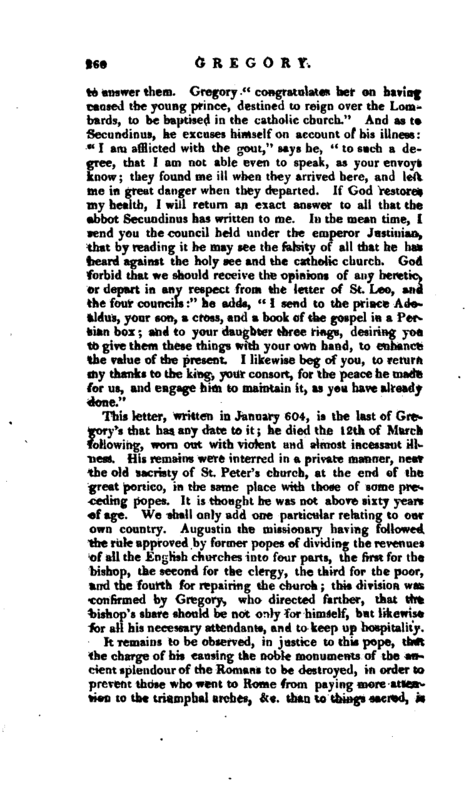 In general he had the pre-eminence of the holy see much at heart; accordingly this same year, one Stephen, a Spanish bishop, having complained to him of an unjust deprivation of his bishopric, the pope sent a delegate to judge the matter upon the spot, giving him a memorial of his instructions, in which among other particulars he orders thus: “If it be said, that bishop Stephen, had neither metropolitan nor patriarch, you must answer, that he ought to be tried, as he requested, by the holy see, which is the chief of all churches.” It was in the same spirit of preserving the dignity of his pontificate, that he resolved to repair the celebrated churches of St. Peter and St. Paul; with which view, he gave orders this year to the subdeacon Sabinian (afterwards his successor in the popedom), to fell all the timber necessary for that purpose in the country of the Brutii, and send it to Rome: he wrote several other letters on this occasion, which are striking proofs of his zeal for carrying on the repairs of old churches, although he built no new ones. But while he was thus intent in correcting the mischiefs of the late war, he saw it break out again in Italy, and still to the disadvantage of the empire, the affairs of which were in a critical situation, not only in the provinces of the west, but every where else. 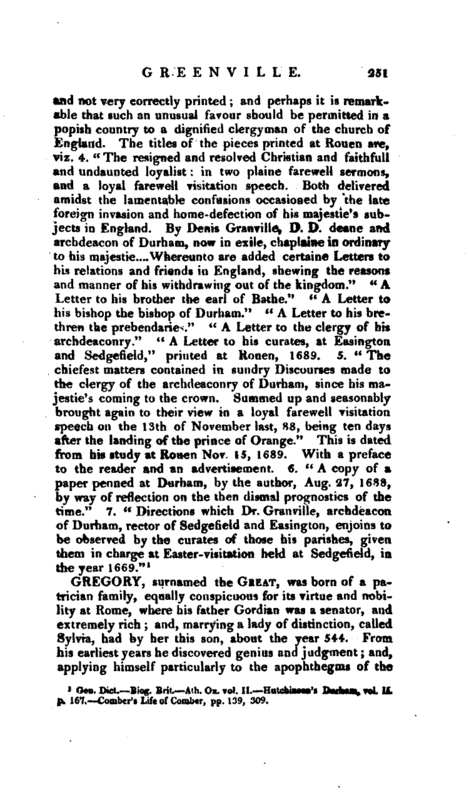 Gregory was much afflicted with the calamities of this last war, and at the same time his illness increased. The Lombards made a truce in November 603, which was to continue in -force till April 605. Some time after, the pope received letters from queen Theodilinda, with the news of the birth and baptism of her son Adoaldus. She sent him also some writings of the abbot Secundinus upon the fifth council, and desired him | to answer them. Gregory “congratulates her on having caused the young prince, destined to reign over the Lombards, to be baptised in the catholic church.” And as to Secundinus, he excuses himself on account of his illness: I am afflicted with the gout,“says he,” to such a degree, that I am not able even to speak, as your envoys know; they found me ill when they arrived here, and left me in great danger when they departed. If God restores my health, I will return an exact answer to all that the abbot Secundinus has written to me. In the mean time, I send you the council held under the emperor Justinian, that by reading it he may see the falsity of all that he has heard against the holy see and the catholic church. God forbid that we should receive the opinions of any heretic, or depart in any respect from the letter of St. Leo, and the four councils:“he adds,” I send to the prince Adoaldus, your son, a cross, and a book of the gospel in a Persian box; and to your daughter three rings, desiring you to give them these things with your own hand, to enhance the value of the present. I likewise beg of you, to return my thanks to the king, your consort, for the peace he made for us, and engage him to maintain it, as you have already tlone." Gen. Dict. Bower’s Hist, of the Popes. Cave, vol. I. Dupin. 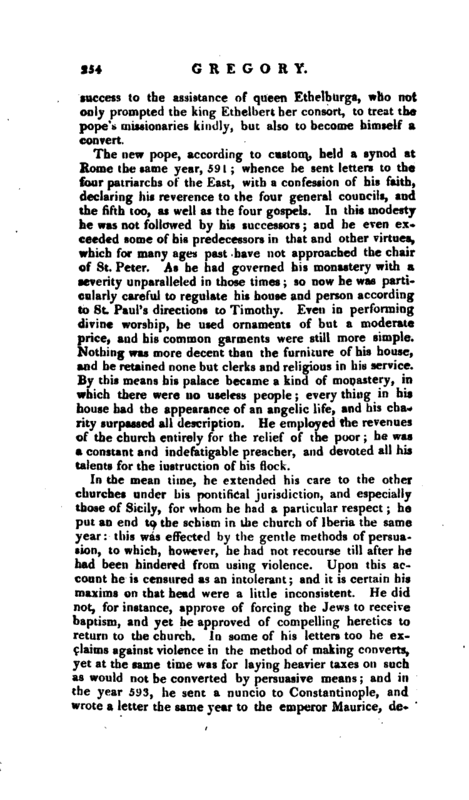 Milner’s Church History, in which his works are analyzed.